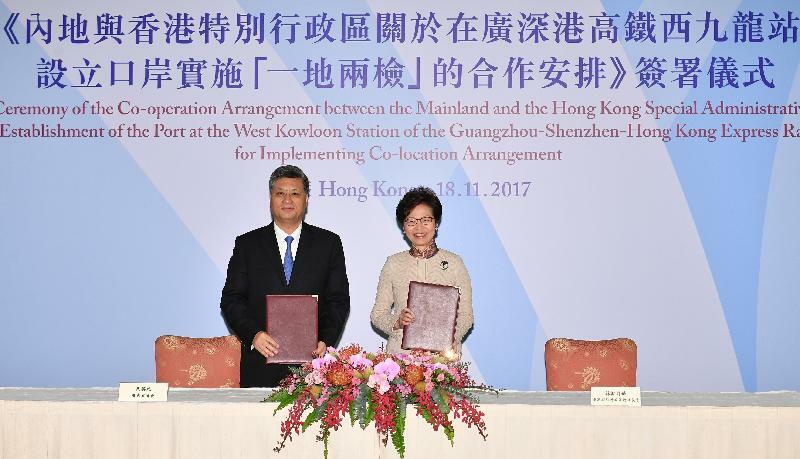 The Chief Executive, Mrs Carrie Lam, and the Governor of Guangdong Province, Mr Ma Xingrui, signed the Co-operation Arrangement in Hong Kong at noon today, signifying the formal commencement of the "Three-Step Process" by the HKSAR and the Mainland in jointly proceeding with the relevant work for implementing the clearance procedures of the Hong Kong Section of the Guangzhou-Shenzhen-Hong Kong Express Rail Link (XRL). The HKSAR Government and the Mainland will then jointly seek a decision by the Standing Committee of the National People’s Congress (NPCSC) approving and endorsing the Co-operation Arrangement, and thereafter commence the local legislative process, so as to meet the target of implementing co-location arrangement at the West Kowloon Station upon the commissioning of the Hong Kong Section of the XRL in the third quarter of 2018. Mrs Lam said, "As a cross-boundary high-speed rail, efficient and time-saving clearance procedures are absolutely essential to realising the full potential of the XRL in terms of speed and convenience. Implementing co-location arrangement at the West Kowloon Station would enable passengers to travel between different destinations across the country with ease and convenience, and allow Hong Kong to provide direct high-speed rail service to an increasing number of Mainland cities. This will fully unleash the transport, social and economic benefits of the Hong Kong Section of the XRL". "I am pleased to sign the Co-operation Arrangement with Governor Ma today and formally commence the 'Three-step Process'. The HKSAR Government will carefully consider the views of different sectors of the Hong Kong community including members of the Legislative Council, and take appropriate follow-up action as we proceed with the work of co-location arrangement with a view to implementing the relevant clearance procedures at the West Kowloon Station in a timely manner." 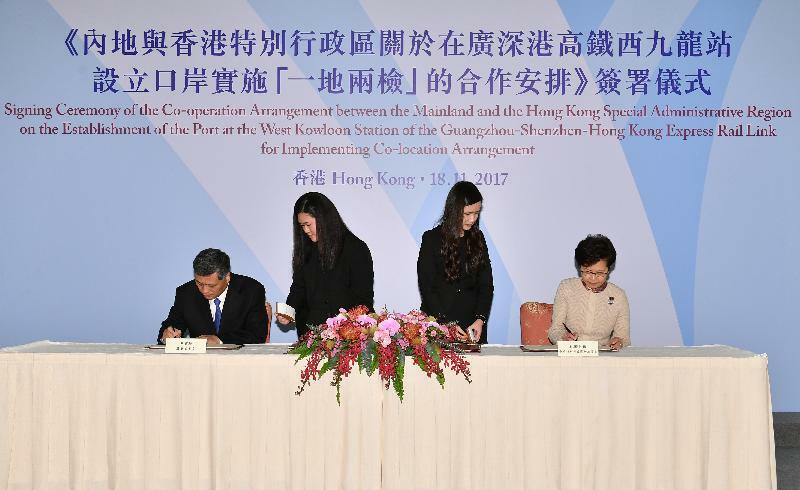 Both sides agree to establish a port at the West Kowloon Station of the HKSAR to implement co-location arrangement whereby both sides will, in accordance with their respective laws, exercise exit and entry regulation, including immigration inspection, customs regulation, and inspection and quarantine measures etc., on departing and arriving persons travelling between the Mainland and the HKSAR, as well as their personal belongings and luggage. The West Kowloon Station Port comprises the Hong Kong Port Area and the Mainland Port Area. The Hong Kong Port Area is to be established by the HKSAR and be subject to its jurisdiction in accordance with the laws of the HKSAR and managed as a cross-boundary restricted area. The Mainland Port Area is to be established by the Mainland and be subject to its jurisdiction in accordance with the Co-operation Arrangement and the laws of the Mainland, and the port administration system is to be implemented thereat. The Mainland Port Area comprises the designated areas on B2 and B3 levels, the platform areas on B4 level as well as the connecting passageways, and includes the Mainland Clearance Area and back office, the waiting hall for departing passengers, station platforms and the connecting passageways and escalators. The compartments of trains in operation on the XRL within the area of the HKSAR (including trains which are in motion, stationary and during embarkation or disembarkation) are also regarded as part of the Mainland Port Area. Immigration inspection authority, customs authority, inspection and quarantine authority, integrated port administration authority and railway police authority stationed by the Mainland will perform duties and functions in the Mainland Port Area in accordance with the laws of the Mainland. They may not enter any area outside the Mainland Port Area to enforce the law, and have no law enforcement powers outside the Mainland Port Area. The establishment of the Mainland Port Area does not affect construction rights, rights relating to the performance of construction work, service concession, operation and regulation and control of the Hong Kong Section of the XRL; nor does it affect the rights and benefits regarding assets (including relevant lands as well as movable or immovable assets on these lands) and facilities pertaining to the Hong Kong Section of the XRL. The HKSAR will continue to handle these matters in accordance with the laws of the HKSAR and exercise jurisdiction over these matters in accordance with the Co-operation Arrangement. (f) Matters under the responsibility of the Hong Kong operator of the XRL as provided for in the Guangzhou-Shenzhen-Hong Kong Express Rail Link Operating Co-operation Agreement (including any subsequent amendment(s) or supplementary agreement(s) thereto) made between the Hong Kong operator and the Mainland operator of the XRL. Except for the matters provided for in paragraphs 5 and 6 above, the Mainland will exercise jurisdiction (including jurisdiction of the courts) over the Mainland Port Area in accordance with the Co-operation Arrangement and the laws of the Mainland with effect from the date of commissioning of the Mainland Port Area. In handling those matters which are subject to the jurisdiction of the Mainland, for the purposes of the application of the laws of the Mainland and the laws of the HKSAR and the delineation of jurisdiction (including jurisdiction of the courts), the Mainland Port Area will be regarded as being situated in the Mainland. Both sides agree to set up a port liaison and coordination mechanism to ensure the safe, smooth and efficient operation of the Mainland Port Area and its effective regulation. In addition, both sides agree to set up an emergency handling mechanism to assist the Mainland in handling sudden or emergency incidents which may occur in the Mainland Port Area in the course of operation. Since the detailed provisions of the Co-operation Arrangement need to be submitted to the NPCSC for consideration at its meeting in December this year, the text of the Co-operation Arrangement cannot be disclosed to the public at this stage. The HKSAR Government will disclose the full text of the Co-operation Arrangement for public information after the NPCSC makes a decision approving and endorsing the Co-operation Arrangement.